Furlong, K. (2016) Leaky governance: Alternative service delivery and the myth of water utility independence. Vancouver, UBC Press. About the Book: Municipalities face important water supply challenges. These are widely attributed to local government politicization. Neoliberal reforms have only exacerbated the strained relationships between water utilities and local governments. In response, organizational reform to increase utility autonomy through alternative service delivery (ASD) has been promoted around the world. For its proponents, ASD offers independence from municipal government without relinquishing control over the utility; for its detractors, it is privatization under another name. Yet the organizational barriers offered by ASD are at best leaky. Deeply interdependent, both water management and municipal governance must be strengthened to meet contemporary water supply needs. Leaky Governance explores ASD’s relation to neoliberalization, water supply, and local governance. Drawing on economic geography and political ecology, Kathryn Furlong examines organizational models for water supply and how they are affected by shifting governance and institutional environments. Her analysis of Ontario paints a complex picture of both ASD and municipal government. Leaky Governance addresses urgent and topical questions in urban governance and water management, tackling increasingly pressing environmental, political, and social issues surrounding water supply and their relationship to urban governance and economics, as well as to broader issues in public policy. For further information and a time-limited discount, see the attached flyer. Norman, Emma and Karen Bakker. Oct. 2004 Transboundary Groundwater Governance: An Annotated Bibliography. Norman, Emma and Karen Bakker. (2007) “Local Stakeholders Governing Water across the 49th Parallel.” Bellingham, WA: Border Policy Research Institute: Western Washington University, 2007. 1-4. Vol. 2. Norman, Emma and Karen Bakker. (2007). Local Canada – U.S. Transboundary Water Governance: Issues, Drivers and Barriers. (Briefing Note). Vancouver, BC: Program on Water Governance. Norman, Emma S. and Jean O. Melious. 2008. “Hidden Waters: Transboundary Environmental Management across the 49th Parallel.” Border Bio-Regions and Coastal Corridors: Transnational Policy Challenges in Western North America. University of Calgary Press. Editors Don Alper, Chad Day, and James Loucky. 195-218. Norman, Emma and K. Bakker. (2010). “Governing Water across the Canada-U.S. Borderland” in Borders and Bridges: Navigating Canada’s International Policy Relations in a North American Context. Oxford: Oxford University Press, editors Geoffrey Hale and Monica Gattinger. 194-212. Norman, Emma, Cohen, Alice, and Bakker, Karen (eds) (2012). Flashpoints and Collaboration: How problems can inspire innovative solutions for Canada, the US, and the governance of shared waters (Report June 2012). Vancouver: Program on Water Governance. Norman, E.S., Cohen, A.C., and Bakker, K. (2013) Water Without Borders? Canada, the United States and Shared Waters. University of Toronto Press. Water without Borders? is designed to help readers develop a balanced understanding of the most pressing shared water issues between Canada and the united states. the contributors explore possible frictions between governance institutions and contemporary management issues, illustrated through analyses of five specific transboundary water “flashpoints.” the volume offers both a historical survey of transboundary governance mechanisms and a forward-looking assessment of new models of governance that will allow us to manage water wisely in the future. This book explores how colonial politics impact water governance – particularly for Indigenous communities spanning international borders. 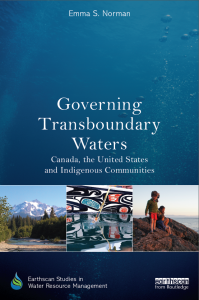 The book examines the cultural politics of ‘transboundary water governance’ in a postcolonial context and highlights how Indigenous-led efforts are reframing water governance and politics. The hopeful cases provide insight into the power of reframing water governance by and for Indigenous Peoples. Endorsement: Bringing together politics of coloniality and indigenous struggles for territorial, cultural and resource rights with water politics at the US-Canada border, this work makes significant conceptual and policy relevant contributions. Skillfully weaving diverse narratives, experiences, and moments of relevance for Indigenous communities on both sides of the border, the book makes for an inspiring read that explores key debates for contemporary water governance. – Karen Bakker and Leila Harris, Co-Directors, Program on Water Governance, University of British Columbia, Canada.